The oil-boiler heating system is autonomous, clean, silent and economical, and is the most effective solution to heat large areas while reducing your energy consumption at the same time. 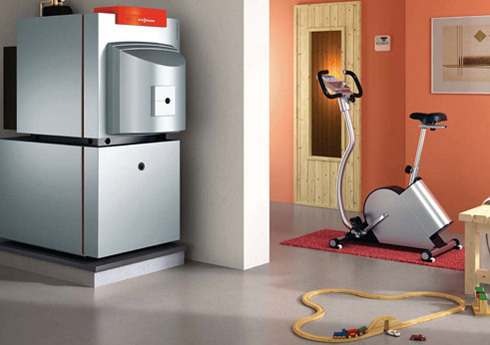 With a lifetime of more than 20 years, the oil boiler ensure your comfort year after year. Modern oil boiler systems are your guarantee of safety and capacity. With the right settings, your oil boiler will be both efficient, economical and more ecological. What’s more, the condensing system gives you a performance boost without increasing your oil consumption, or as a result, your heating bill. The condensing oil boiler burns oil to give you the heat of its combustion, just like a classic oil boiler. On the other hand, the condensing oil boiler also recovers the heat of the fumes issuing from oil consumption that are then cooled. The condensing oil boiler system performs 15% to 20% better than a classic combustion system. An inner and an outer tank allows you to stock up on oil from the supplier of your choice. Your condensing oil boiler can also be used to supply you with sanitary hot water thanks to the addition of a hot water tank. Replacing your old, classic boiler system (more than 20 years old) with modern equipment allows 20% energy savings and does not involve any particular adaptations. Since 1st September 2014, installing or replacing you classic oil boiler with a condensing oil boiler has enjoyed a 30% tax credit. Annual maintenance of your oil boiler installation verifies the main points in operation and safety. Clim Var Froid guarantees you expert maintenance with cleaning and verification of all the parts of you oil boiler. After analysing fumes and combution, your Clim Var Froid expert makes adjustments to the settings to ensure you greater heating efficiency. Choose the Clim Var Froid annual maintenance plan, from €198.